I couldn't resist getting this nail polish when I saw it in the store. It's not so much because of the colour, but because of the picture on the box. The innovative double brush with two parallel arranged brushes provides a new polishing experience - the nail varnish can be applied evenly and without stripes. 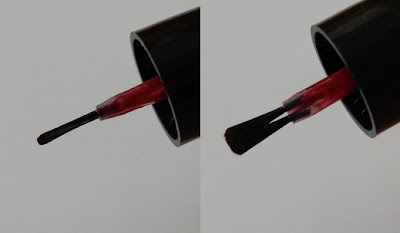 The rounded tips enable quick and easy application. I don't know if this is something totally new (there are already polishes with extra wide brushes on the market), but a quick check of the polishes that I have shows that all the brushes are flat and angular. This one from ARTDECO is flat, a tad wider (2x brush) and has rounded corners. Quite unusual. With one stroke, this brush covers about four-fifths of my nail (with the exception of the thumbs, of course). I like the rounded corners. It makes sense: our cuticles are round-shaped after all. So, I did find polishing easier with this brush. There was no streaking but I wouldn't attribute that to only the brush. The formula of the polish must also have something to do with it. ARTDECO says this polish is toluene-free. I checked the list of ingredients and sadly, it has formaldehyde resin. Sigh, really, ARTDECO......in this day and age?! Red Violet a.k.a. No. 318 is a super glossy maroon brown shade. I have here two coats on. I like it but I was itching to do something further, so I applied a matte top coat from HEMA. You can see the difference in the following two images. Then, I stamped a flower design from Essence Nail Art Stampy Design Plate 03 Be Creative with a black KONAD polish. It's nothing fancy, I know. It's just a mattified subdued colour with a simple stamp design. I got this polish for €8.50 (6ml). ARTDECO is a German brand and, as far as I know, in The Netherlands, it's available at selected Douglas Parfumerie stores. That is a nice glossy red. 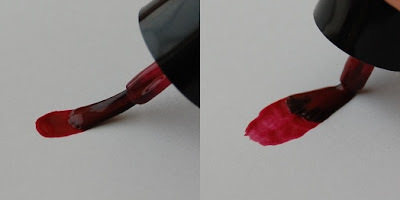 How can you apply your nail polish so evenly without any smearing on the cuticles? I love the brush, I'd like to try it too. Sad that the polish contains formaldehyde resin and that the price is a little bit high. Great pick, dear! that dual brush is such a clever idea! What a beautiful glossy maroon color. Never seen such a brush b4 either. :) "KTee"
i have the same shade of a different brand!! But the brush isnt similar :( hope I find something similar in local shop! !